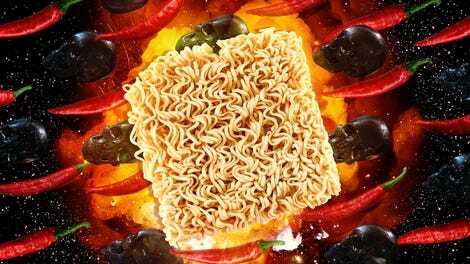 Being a parent of a toddler, as I found out, mostly involves finding things to keep the kid busy and looking for convenient lunch options. There’s a Jimmy John’s two minutes from our house, so that’s where we went over the weekend. I was about to make my usual #9 order (Italian Night Club) when I noticed a jar by the cashier with elongated sandwiches sticking out of it. 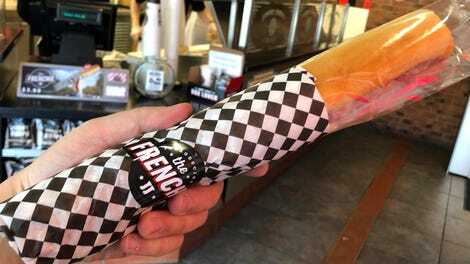 Turns out this was The Frenchie, a ready-made baguette sandwiches that made an already freaky fast order freaky faster. This $5 sandwich features salami, capicola, provolone cheese on a buttered baguette roll, meant to replicate the bare-bones simplicity of the jambon beurre. My sandwich philosophy has always veered towards the simple—I prefer fewer ingredients to more—so this Frenchie sandwich intrigued me greatly. You know what? It’s really good! For those reasons I articulated in the last paragraph: simple cheese and meats on a decent roll, nothing more. I’ve always thought the bread at Jimmy John’s was better than most chains, and with this elongated shape there is more pleasantly chewy crust to enjoy. The butter isn’t some luxurious high-fat European butter, but some sweet richness pokes through. I probably could use a sprinkle of salt in the sandwich, but it’s not a dealbreaker. This sandwich (available for a limited time) isn’t a gut bomb like my usual #9 Italian Night club. By following the less-is-more ethos, the Frenchie represents Jimmy John’s foray into Pret A Manger-level sophistication. I hope they keep this sandwich around.